commented on "Washable Loose or Slipcovers for Sofas & Chairs, Melbourne & Gippsland areas"
We can custom make a large range of loose or slipcover to give your furniture a new look. We have an amazing range of washable colours to mix and match with. 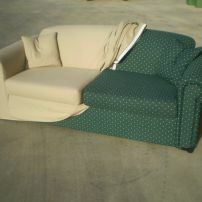 Email enquiries@jaro-upholstery.com.au or ring us on 0402 188238 for further information.